Pour the contents of the tin of herring in a large skillet. Add the remaining ingredients. Use a spoon to break up the herring into bite-sized pieces and saute until the mushrooms are cooked and the greens are wilted. Allow to cool slightly. In a large bowl, stir the salt and pepper in the eggs. Fold in the vegetables and matzo. Pour into a greased 8x8 inch baking dish. Bake for 30 minutes or until fully cooked through. Allow to sit 2 minutes prior to slicing and serving. Passover is wrapping up but maybe you are like me and still have a bit of matzo to use up. This dish transforms the traditional breakfast dish, matzo brei (basically sweet or savory scrambled eggs with broken matzo), into a dish that is much hardier and can even serve as a dinner, lunch or brunch dish. I used a ton of local fresh greens in this recipe; so much so the whole dish turned nearly green itself. The arugula added a peppery bite which offset the rich, smoking herring. The matzo get rather soft and disappear into the egg except for the bits that peek out of the top, they stay much crispier. 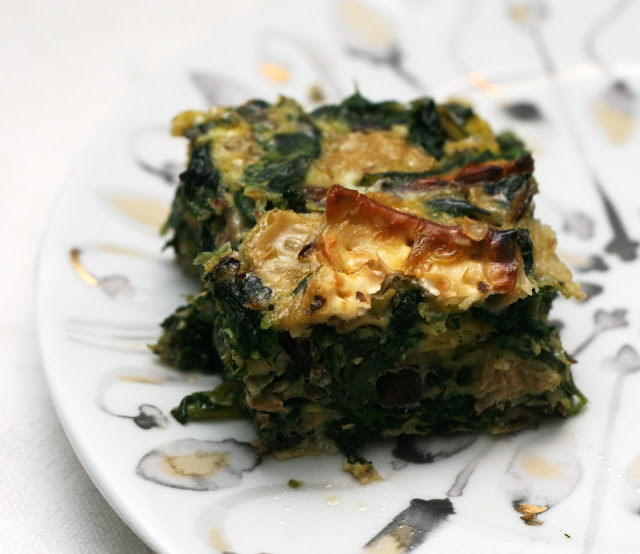 Think of it as a Jewish twist on a breakfast casserole, frittata or strata.